Having developed two of the most prolific and respected guitar programs in the world (Berklee School of Music in the 1960s and University of North Texas in the 1980s), Jack Petersen is arguably the most influential academic jazz guitar teacher of our time. Mick Goodrick and John Abercrombie, to drop a couple big jazz guitar names, and countless other great players all went through the "School of Jack Petersen." This book presents Jack's revolutionary systematic chord voicing techniques for guitar. 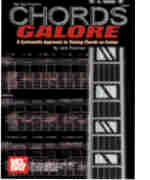 This easy to use system is a must for anyone serious about learning and understanding chords on guitar. Concepts of root position chords, inversions and a number of other voicing tricks are covered with standard notation, tab, and chord diagrams.